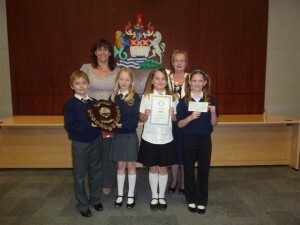 August 2012 – Pupils from Lawn Primary School Northfleet have won this year’s annual competition to find the Tidiest School in Gravesham. At the Mayors Parlour in the Civic Centre last Monday 9th July 2012 representatives from the school were awarded a cheque for £250 and a certificate together with the annual challenge shield. The competition which is run by the Rotary Club of Gravesend is now in its 25th year and is open to all the primary schools in Graveseham.